My wife and I are looking at 7 passenger SUV's and I really like the fuel economy in our current VW Golf TDI; however, family needs have changed and we need some space. We're thinking about the BMW X5 diesel but are hearing some concerns about its reliability(both electrical and engine). Please send me your experience! I have a 2011 X5 3.5d with roughly 66,000 miles. I am the only owner. The engine was performed great for us; however, since 60,000 miles, we have had some pollution control problems. A check engine light in April resulted in a replaced glow plug and a return two weeks later as the original diagnosis proved to be wrong and it was the glow plug control unit tossing out faults. A few weeeks ago, the electronic throttle body failed. I cannot attribute the throttle body issue to the diesel engine, however, as every BWM I have owned since 2000 (3 sedans in addition to X5) were gasoline-powered and had the same problem -- only at below 20,000 miles. We have been very pleased with the car up until the first check-engine light incident though the extended warranty resulted in a $50 charge for the glow plug and zero for the control unit. The throttle body was covered under a special 70K warranty (which tells me BMW knows about the throttle body problem. Only time will tell if those will be our only problem. The engine is quick starting, quiets down at cruise and gets over 25 mpg cruising 78 mph on the highways between Pennsylania and Maryland (traffic flow norm) with plenty of torque to spare. When the fuel-additive warning sounds, you get an ominous message the engine will not start in 1000 miles unless you replace it. I have done it twice although the dealer usually tops it off during normal servicing. BMW has done a lot to improve their dealer service quality since our first 2002 in 1974; however, not all are fully trustworthy I recommend some research in that department as well, if you plan to use the dealer service department. Having lived in NC, Cincinnati, Fairfield County, CT, Chicago 'burbs and Philadelphia, I have seen the best and worst--although they were all head and shoulders above my experiences with Audi. 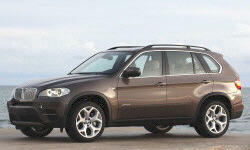 The X5 is an excellent SUV in many ways. My 2017 xdrive3.5 is just under 10k miles now and it is a superior vehicle in its handling, performance and safety. The onboard technology is powerful and easy to use; it is so intuitive that you can figure it out without a PhD in gaming. It seats 5 passengers very comfortably (I didn't buy the 3rd row seats). Before this vehicle I owned a 2014 535d and a 2014 428i, both leased. Our 535d had many engine problems right from the begining. It required a lot more maintenance than the 428i. We found it unreliable for long distance traveling, which is a shame since it ran 45 mpg. At the end of lease, it was worth $10k less than the 428i with the same miles on it: I am glad we chose to lease instead of buying. After reviewing many YouTuve videos, online information and speaking to a large number of BMW technicians and enthusiasts, I've repeatedly heard that German Diesel fuel is different than the one sold in IL; it is cleaner and more suitable for a high performance engine like the BMW 3.5d liter motor. Our local Diesel fuel seems OK for powerful yet low-tech engines found in pick-up trucks and machinery, but it is troublesome for sophisticated engines. If you consider the X5 eDrive as an option, keep in mind that the 3rd row seats may not be available for it since the battery pack may pose a conflict. Otherwise, it is very powerful and great on miles. It comes with air-ride rear suspension, standard (needed for the battery pack). Very nice vehicle. I have 95K miles on my 2011. Very reliable drivetrain. Electrical and emission issues are plenty. Never own one without a warranty. Def tanks replaced. Door sensors (three) replaced. Airbag sensor replaced. Very high service costs if done by dealer. Great handling. Good, but not great mileage. Comfort seats are the best. Extended warranty through Lexus cost $4K. More than $9K in repairs at no cost to me. It costs more to run this SUV than my 911. It never failed me. Handles like a dream. Great seats. Quiet. Pulls a boat like nothing. Diesel torque is addictive. Love it, but when the warranty is finished, I will trade it for another X5d.